When I joined the cast I found the writers would write about 'How would a deaf person do this?' 'How does a deaf person do that?' And it was just related to my deafness and it didn't feel like they were treating me as a person. I found my character one-dimensional and kind of boring. It showed how brave a deaf person was to do this and that in everday life. I said it was no big deal. I have a sense of humor; why don't you show that? I can be angry over something. Show that I can have a relationship with another person. Today is the birthday of Linda Bove, born on this date in Garfield, New Jersey. 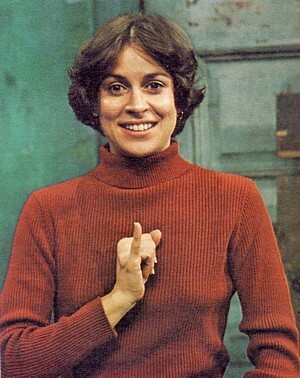 If you were a hearing American kid in the 1970s, chances are the first place you saw American Sign Language was on Sesame Street--and chances are, it was being used by Linda Bove, one of the show's longest-running cast members (1972-2003). Bove attended Gallaudet University and became involved in theater as a student; she toured with the National Theater of the Deaf, and co-founded the Little Theater of the Deaf and Deaf West Theatre Company. Disability Blog Carnival #50 is up NOW! Yes, #50. Many blog carnivals don't stay around long enough for a dozen editions, let alone two years' worth of quality collections--but thanks to all the hosts, contributors, and readers, we're still rounding up links from all over the disability blogosphere for a twice-monthly (except in December) carnival. The current edition is up at The Life and Times of Emma, with posts based on the theme "I am" -- a lot of honesty in this crop, as Emma observes, along with the usual quotient of passionate, funny, relevant, searching, and wise contributions. The next edition will be hosted by Shiloh at Sunny Dreamer, on Thursday, December 11, and the theme is "favourite quotes, songs, writings, scriptures etc - specifically the ones that you turn to during the bad times and how they help." Submissions are due Monday, December 8, and can be offered through the blogcarnival.com form (warning, inaccessible CAPTCHA is still in place), through comments here, by email to Shiloh (celtic_me2000@yahoo.com), or just try putting "disability blog carnival" in the text of your post--I usually find those too. Finding items like this on the front page of Amazon makes me less enthusiastic about holiday shopping this season. The Rabbids have taken over almost every channel you can imagine, from music to movies - even TV ads. 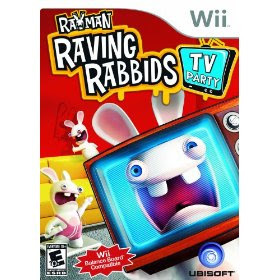 Help the Rabbids destroy all our daily viewing and drive Rayman crazy. In Story Mode, play through a week of television, with each day bringing new wacky challenges of skill and insane movements in a compilation of mini-games. With up to eight players in turn-based mode and four players simultaneously, get ready for you and all your friends to go insane. Really, they need to use the word "insane" twice in four sentences? Crazy, wacky, raving, and rabid too... which all apparently mean screaming with wide open mouths and unfocused eyes, causing havoc, chaos, destruction? "Get ready for you and all your friends to go insane." Lovely. Co-founder of Lighthouse International (formerly the New York Association for the Blind) Winifred Holt was born on this date in 1870, in New York City, the daughter of publisher Henry Holt. She was a force in early twentieth-century advocacy --she and her organization worked for inclusion of blind children in New York public schools, for summer camps, vocational training programs and social groups run by and for blind people, for rehabilitation of blinded WWI veterans. She also worked for changes in medical protocols to prevent a common cause of blindness in newborns. She encouraged similar "Lighthouses" to operate in other cities around the world. Many of the projects she started continue in some form today. 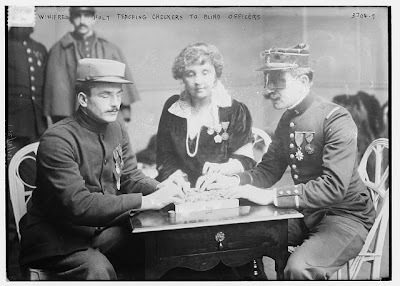 In the photo above (found here, in the Library of Congress's Bain Collection), Holt is seen teaching newly blind French soldiers to play checkers in a rehabilitation program in France (Holt received the Legion d'Honneur for her wartime work there). Holt trained as a sculptor when she was a young woman; her best known work is a 1907 bas-relief bronze portrait of Helen Keller, online here. She also wrote a biography of blind English MP and postmaster Henry Fawcett. The fires here in Southern California are wreaking more than their usual havoc--it's bad this time, so many houses destroyed and people evacuated and highways closed, and the air quality is rotten for millions (worst I can remember, in our part of LA). They're saying we might also have power outages over a wider area of the county, in connection with the fires. One of the many places threatened yesterday was the California headquarters of Guide Dogs of America, in Sylmar. (One of the major fires right now is centered on Sylmar.) There are emergency shelters for dogs and horses and other animals set up--but just like with people, this event has to be disruptive and stressful for them, and hazardous to the health. The LAFD has a blog (who knew?) with constant updates for specific places, including Sylmar--seems like a good place to check if you know which neighborhoods you're worried about. Disability Blog Carnival #49 is up NOW! Blake at I Hate Stairs hosts the latest edition of the carnival, a list of links about lists--lists humorous and cynical, to-do lists and lists of excuses and fallacies, lessons learned and good ideas--something for nearly everyone, I suspect. Go have a read. The next edition--the big #50--will be hosted at The Life and Times of Emma, around the theme "I am." Submit links for consideration via all the usual channels--in comments here or there, using the blogcarnival.com form (warning: CAPTCHA involved), or put the phrase "disability blog carnival" in your post--I usually find those too. The next edition is scheduled to post on 27 November--that's Thanksgiving in the US--so get your posts in by Monday 24 November, then you can bake (or eat) pies while you wait for the big event. Well anyway, that's what I'll be doing. Scottish painter Walter Geikie was born 9 November 1795, in Edinburgh. When he was two years old, he survived a serious illness with total deafness; because of his early age at the time, he didn't develop spoken language, either. Geikie's father, a wigmaker, believed the boy could learn, and taught Walter to read and do basic math. 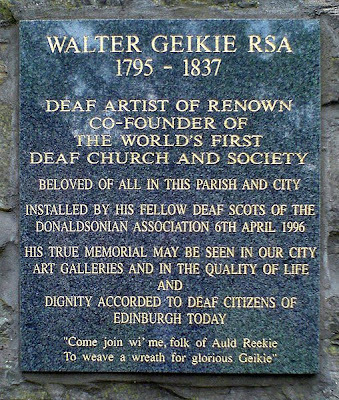 At 15, Walter was admitted to the new Institute for the Education of the Deaf and Dumb in Edinburgh, but soon his skills prompted a transfer to the Trustees' Academy of Industrial Design. Geikie studied drawing at the Academy, and became a successful artist, specializing in scenes of urban life. He exhibited paintings in Edinburgh to critical acclaim. He also published two volumes of etchings. Walter Geikie was voted into the Scottish Academy of Painting, Sculpture and Architecture as a academician in 1834. Geikie died suddenly from typhoid fever at the age of 41. A posthumous collection of his works, titled "Etchings Illustrative of Scottish Character and Scenery," was popular and helped keep his name before Scottish audiences through the mid-nineteenth century. Elizabeth Bredberg, "Walter Geikie: The Life Schooling and Work of a Deaf Artist at the Beginning of the Nineteenth Century," Disability & Society 10(1)(1995): 21-39. Archibald Geikie, "Brief Sketch of the Life of Walter Geikie, Esq., R. A. S., Edinburgh, Scotland," American Annals of the Deaf and Dumb 7(4)(July 1855): 229-237. Harry G. Lang and Bonnie Meath-Lang, Deaf Persons in the Arts and Sciences: A Biographical Dictionary (Greenwood Publishing 1995): 141-143.